Prasar Bharati, Doordarshan has new plans to launch DD Direct Plus with new brand name "Freedish" Direct to home service for India. According to Indiantelevision.com trademark has already been registered. Freedish would be launch with 61 extra new channels, so total channel would be on dd direct plus about 120 TV Channels. Prasar Bharati has already announced tender for BIS Compliance set-top box, these set-top box would be activate from Freedish DTH customer care. 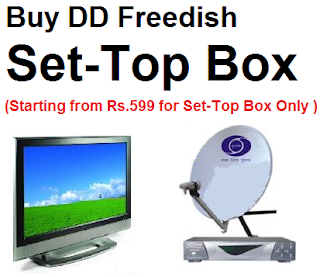 Although DD Direct Plus subscribers already using free to air set-top box to get 59 ku-band channels, these channels filled by online e-auction system. At this time there is no quality / testing in current set-top box, but after launch "Freedish", subscriber will get only BISS certified set-top box can use and they will get warrantee and better equipments for better picture quality and sound. DD has plan to broadcast other 61 channels in mpeg-4 quality, so it means old mpeg-2 cheap set-top box will not be able to receive these channels from Freedish DTH. This is new future of free to air digital TV. Koi btayega kya problum he..? I have FTA receiver and can I use Videocon d2h HD receiver to receive Free dish mpeg4 channels, how to activate receiver.